The endemic species with this name grows only in Jelasnica and Sicevacka Gorge in Serbia and nowhere else in the world. This plant is called the Serbian phoenix flower since it can survive the most unfavorable conditions of draught during which it is almost dead but as soon as better conditions appear it lives again. In 1928 a herbarium made by a Russian scientist included this plant. By accident he spilt some water over it and the plant previously totally dry, produced flowers. This was registered in the Russian Botanical Journal in the same year. It’s beautiful – almost reminds me of the African Violet. 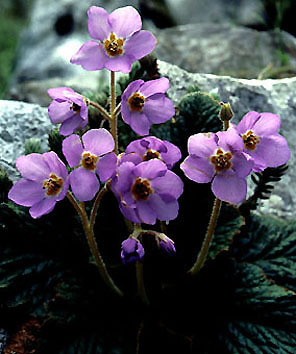 This plant can also be found in Bulgaria , near to the border with Serbia ! Pingback: There is a flower that comes to life even if it is bone dry! | my travels. my indulgence.